The familiar opening melody played by the ever-present fiddler (a spiritlike Tyson Forbes, always observing and reflecting the mood of the scene on his face, when not playing other characters) puts us right into the story we think we know, but the opening number "Tradition" tells us that this is not your average Fiddler. The multi-ethnic cast reminds us that while this is specifically a Jewish story, it's also a story that has been and continues to be repeated around the world in various cultures. While this song clearly lays the specific gendered places of everyone in the family, the mamas and the daughters are played by men, and the papas and the sons are played by women, turning the idea of society's strict gender roles on its head and making us see them in a new way. As each of Tevye's three eldest daughters begins to break away from tradition in increasingly extreme ways (marrying a village man of her choice, marrying a radical from Kiev, marrying outside of the faith), we watch Tevye's inner monologue as the action freezes and he weighs the one hand against the other hand (and the other other hand). You see the conflict in Steve Epp's face in the up-close-and-personal, All the Lights On makeshift theater space, and you understand and empathize with the choices he makes. But this is not only Tevye's story, especially in TTT's version. They've turned some of the men's solo songs into duets, so that we get to see more of the female perspective on the story. Thomasina Petrus' Golde is a force to be reckoned with (and when she puts on a fantastic beard to play the butcher, be prepared to laugh!). Elise Langer, Sheena Janson, and Joy Dolo all give wonderfully heartfelt performances as the daughters who dearly love and respect their father, yet are determined to make their own choices. Eric Sharp, Kory LaQuess Pullam (Twin Cities Theater Bloggers' favorite new artist of 2016), and Tyson Forbes are all charming as the chosen grooms, as well as other characters. Last but not least is the inimitable Dennis Spears with a wide range of performances as the Rabbi, the Russian Constable, and the matchmaker Yente, working every flounce of his skirt. The entire cast is so open and playful, they're truly a joy to watch. What I love most about TTT's musicals is the beautifully sparse music (arranged and played on all the instruments by Peter Vitale, along with Tyson Forbes on fiddle and a few other stringed instruments). This has the effect of smoothing out the often jarring transitions between music and dialogue in traditional musicals. The characters are talking, and then slowly morph into singing with subtle musical accompaniment, and then they're talking again, and you don't even realize the difference. It's all part of the storytelling with music organically woven into it. This was my first time seeing Ten Thousand Things at Augsburg College, and it's always fun to see how they adjust to a new space. But despite the fact that they use minimal set pieces (here just a table and the arch of a doorway with interchangeable signs, designed by Stephen Mohring), you soon forget where you are entirely as you become caught up in the power of collective imagination. The costumes are traditional shapes done in modern fabrics, with Trevor Bowen's deconstructed patterned, painted, patchwork design utilizing denim, plaid shirts, and vests. And the stunning and scary gown in the (thankfully shortened) dream sequence, draped over Tyson's already tall frame standing on a ladder, is a showstopper. 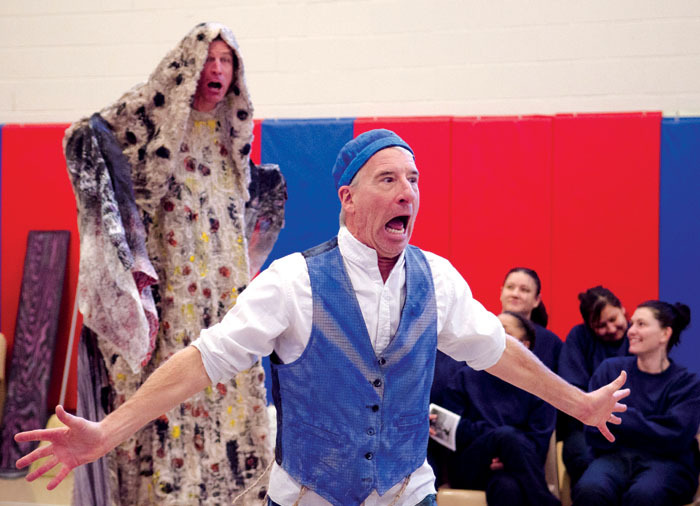 I just cannot speak highly enough of Ten Thousand Things and the work that they do, which includes traveling around Minnesota and performing in small towns, prisons, community shelters, and various other locations where residents typically are not exposed to theater. And a funny thing happens - in making the story accessible to all kinds of audiences, they also make it more clear and pointed for us more experienced theater-goers, in a surprising, playful, and highly affecting way. Sitting in the front row of the fully lit room, I tried very hard to hold back tears at the emotional conclusion of the play, and I think I mostly succeeded. But my heart was full. 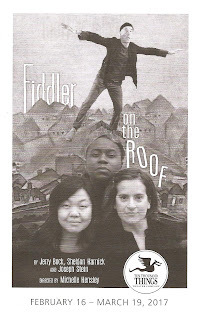 Fiddler on the Roof continues through March 19 - don't miss it!! Saw it this past week at Minnesota Opera headquarters. It was a great Venue for this piece, which I really enjoyed.